Over the weekend, 8 IJA referees attended the NIJF Refereeing Seminar held in Maghaberry, Lisburn. 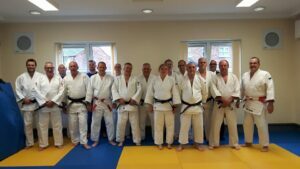 IJA Referees Mr Michael Power, Mr Eoghan Barr, Mr Maurice Cooper, Mr Anthony Delaney, Mr Frederic Marmain, Mr David Holmes, Ms Renata Tekoriute & Mr David Rolland joined their colleagues from the NIJF for this seminar. The Refereeing Seminar went very well, covering a range of current issues clarifying a number of points relating to the implementation of the 2017 rule changes. The ‘testing period’ for these rules will end after the World Championships finishing 3rd Sept 2017. In addition to demonstrations on the mat, tutors also worked through a range of video situations discussing the IJF commission interpretation and rationale. Our IJA referees acquitted themselves very well during this discussion and interactive session. Mr Eoghan Barr, Head of IJA Refereeing Commission felt, as an association, we will benefit from attendance at events like this, the referees who attended will feel more confident in the application of the 2017 rule changes. This event was co-funded by the individual referees and the Irish Judo Association. Our thanks to the NIJF.